On a lap 92 restart, Sheldon Creed rode off into the sunset of the 2018 ARCA Racing Series presented by Menards season, scoring a picture perfect restart to drive away from Harrison Burton and Michael Self to win his fourth race of the year. Creed, who clinched the 2018 title after qualifying for Friday’s race, ended up with an average finish of 4.2 for the season, with Burton, Self, Riley Herbst and Chase Purdy rounding out the top 5. It was fitting on a number of levels for Creed to win this race. For one, his No. 28 has been the dominant car in 2018, scoring 15 top 5 finishes in 20 races. But also, on a night filled with attrition, Creed scored the win with a visibly damaged race car. While leading on lap 46, Creed made contact with the lapped No. 68 car of Kevin Hinckle, sending Hinckle’s Ford spinning into the infield grass while Creed’s left door panel was peeled back behind the wheel well. Despite the damage, the No. 28 car rocketed back through the field, aided by numerous wrecks that marred the final 40 laps of the 2018 season. In addition to winning the series championship, Creed also clinched the award for most laps completed in 2018 after Travis Braden was taken out in a lap 35 crash. Creed will immediately benefit from his success, as he has signed to drive the last four races of the 2018 Truck Series schedule with GMS Racing. Sheldon Creed called his victory “Kyle Busch stuff” in Victory Lane, and he had a case to make for that after scoring the win Friday night. Creed benefited from late race attrition and yellow flags, but to storm through the field the way he did in a damaged race car was nothing short of impressive. Creed’s consistency and car control has been on display the second half of 2018, and he’s definitely ready to graduate to major league NASCAR. Given the melee that this race turned into, that Harrison Burton had a relatively quiet runner-up finish and managed to finish without a scratch on his No. 12 Toyota was quite the accomplishment. That said, Burton did spend time on pit road with the hood up due to a popping ignition. That dropped Burton to the back of the lead lap, from where he fought to get back to the front. Burton finished his 2018 ARCA slate with eight top 10 finishes in nine starts. Tyler Hill recovered from an early race spin on lap 2 to finish seventh, a career-best result that marked the first top 10 finish of the season for the No. 10 Fast Track team, and the first for the Fast Track organization as a whole since Will Rodgers finished eighth in the No. 11 at Charlotte back in May. Drew Herring ran considerably better than his eighth-place finish shows, after winning the pole in his first ARCA start in nine years. Herring led the first 20+ laps of Friday’s race and was contending for the lead when contact with Self on lap 64 cut his left rear tire and damaged his right rear fender. While Herring was a victim on the night, it was a viable showing for a driver that’s been relegated to testing duty in recent years. Natalie Decker’s sixth place finish was her career-best on an intermediate oval; Decker recovered from a spin through the infield grass on lap 72 battling for the lead with Codie Rohrbaugh after staying out on old tires. It was inconclusive from video replays whether Braden or Joe Graf Jr. were at fault for their lap 35 wreck, but the result was the same for both drivers…wrecked race cars and an early exit from the season finale. 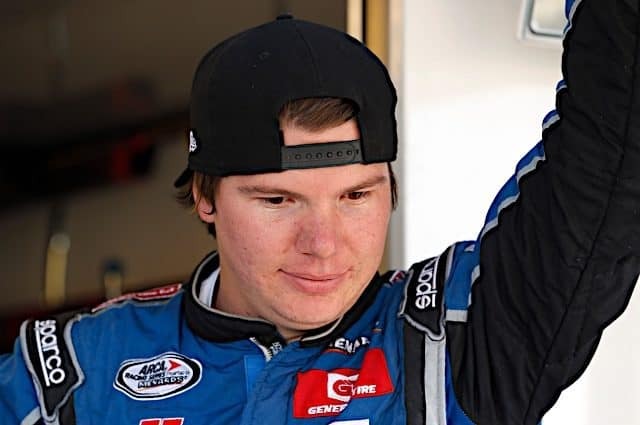 The wreck cost Braden a shot at the season laps led award and marked his first finish outside the top 15 since Daytona, while Graf finished the season with four finishes outside the top 10 after banging his way to victory at Berlin in August. Gus Dean fell victim to a slashing Herbst on lap 78 and ended up collecting Zane Smith in the same incident. Following a restart, Herbst merged down the backstretch trying to avoid an off-speed Anthony Alfredo, but in doing so cut right across the nose of Dean’s No. 32. The resulting contact sent Dean spinning on the backstretch right into the path of Smith’s No. 41. 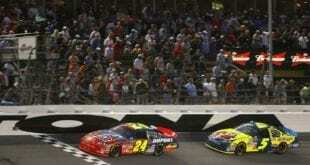 Both drivers got out of their cars under this own power, though Dean was seen limping to the ambulance. Both drivers finished outside the top 15. It was bad enough seeing a 100 lap race on an intermediate oval interrupted by eight cautions, but some of the damage to the field seems to have been avoidable. The last sprint to the checkers saw numerous cars at the front of the field seemingly find trouble out of nothing, including third-place runner Self and top 10 runner Cole Glasson, both of whom had charged to the front from starting at the rear of the field (Self for stopping on the pace laps, Glasson for a transmission issue that prevented him from qualifying). Immediately following the checkered flag flying, Phil Parsons noted that Alfredo’s engine had expired in the closing laps, and that potentially oil on the track was responsible for the late rash of incidents. Seeing almost as many composite body race cars torn up in the finale as were torn up during the season opener’s overtime debacle at Daytona was ugly enough. But if Parsons’ observations are accurate, and oil on the track was missed for three laps coming to the checkers, that’s more than ugly. That’s dangerous. ARCA announced on Friday that the series’ second race of 2019 will be hosted March 9 at the Five Flags Speedway, marking their first visit to Pensacola since 1996. The date is apparently coming at the expense of the Fairgrounds at Nashville, which has hosted ARCA’s first short track date annually since 2015. Here’s hoping it goes better than the last two times ARCA tried this; outside of Daytona, the series’ Florida visits to the old USA International Speedway in 2007 and Palm Beach International Raceway in 2010 each lasted only one year. Creed’s exploits on Friday night exposed the inherent risks and rewards of how the ARCA Racing Series’ traditional points championship contrasts with NASCAR’s playoff system. Thanks to a gargantuan points lead, Creed had the title won before the green flag dropped on Friday. It made his run-in with Hinckle, and his subsequent recovery, a lot less dramatic than it would have been under the “Final Four” model. Under that model, his charge would have been far more significant. And while the “final four” model does manufacture drama, in this instance where Creed actually had won fewer races on the season than second-place Smith, would it really have been that unfair a system? With the impending merger of ARCA and NASCAR now one season away, this will be the first of many such comparisons to be made.